Welcome to Shore Thing where you can turn your holiday into an unforgettable memory. Enjoy luxury accommodation, fabulous views and scenery, spectacular fishing, bush-walking, snorkelling, surfing, water sports and more. Meticulously renovated to the highest standard and family friendly: it is everything a beach escape should be. Shore Thing is so homely you won't want to leave. That is until you look outside. The house is built on the edge of a lagoon with stunning 180 degree views to the ocean. You can swim, fish, paddle-board and kayak right from your back door step. Or sit back on the deck and view the daily parade of holiday activity: from paddle-boarders at high tide to soldier crabs at low tide. Shore Thing has everything an old-fashioned family holiday needs: most of which are easily accessible by foot. Zac's Place for fish and chips is a few minutes stroll away but it's hard to beat BBQing on the deck with parakeets and kookaburras dropping in, pelicans gliding onto the lagoon and the sun setting below the horizon. Shore Thing is so homely you won't want to leave. There are 5 spacious bedrooms, 3 bathrooms, 2 living areas and a billiard room. It has a fully equipped galley kitchen and a sun-drenched deck with a BBQ, overlooking the water. It caters to a maximum of 12 guests. It's a double-storey house, there's another secluded deck downstairs with a day-bed and lounge setting. There's plenty of private spaces for everyone. There are three bedrooms upstairs.The master has a king bed with an ensuite and a private deck that overlooks the water. There are two other bedrooms upstairs: one has a queen bed & the other a trio bunk - they both share a bathroom. There's a laundry, kitchenette, 3/4 size pool/snooker table and rumpus room with large LCD TV and DVD player. There's an outside shower, which is perfect for rinsing off after a swim. Shore Thing is situated in the sleepy outpost of Currarong: a quiet seaside village where time stands still. It is 2.5 hours drive from Sydney and 2.5 hours from Canberra. The beaches are beautiful, peaceful and uncrowded. There are excellent bush-walks in the National Park at Beecroft Head, where you can spot dolphins and whales and explore the shipwreck of the SS Merimbular. Visit Point Perpendicular light house at Beecroft Peninsular with spectacular views over Jervis Bay. Discover the stunning secluded white sand beaches such as Long Beach and Honeymoon Bay at Jervis Bay, just 10 minutes drive away. Everything in Currarong is walking distance from the house. The General Store is a few minutes up the road. It has food and supplies, take-away food, a bottle shop and a restaurant called Zac's Place. There's a Bowling Club with pool tables , a bar and a Chinese. The closest shopping centre is 10 minutes away at Callala Beach, with an IGA and a variety of other shops. Nowra is half an hour away with supermarkets and a shopping centre. There is an optional linen service where all bed and bath linen is supplied , beds are made up for you and it's all washed afterwards. You just need to bring your own beach towels. The price is $195 and can be paid to me directly, I can provide my bank details if you'd like to take up this option. Alternatively, you can keep the price down and bring your own linen and I can detail what you'll need to bring. I also take a $1000 refundable damage deposit 10 days before the booking. I'll send you an email regarding the linen and bond once you make a booking. Please like and share with friends, upload your own pictures from your holidays and share your experience. I'd holidayed in Currarong since I was a child and I wanted my children to have the same experience. We bought a small house across the road from this one in 2000 and we had some wonderful holidays there. This house came up for sale and we thought that it would be fantastic to be on the water and have a house with more space. It needed a major renovation, we were able to keep the original look at the front of the house and extend the back to make the most of the incredible views. There are three bathrooms in the house. There's an ensuite upstairs and another bathroom with a bath and separate shower. There's another bathroom downstairs. Shore Thing sits on the edge of a lagoon in a quiet , tranquil location Swim, snorkel, fish and kayak in your own backyard. It has uninterrupted water views from the decks, living and some bedrooms. There are two open-plan living areas: a perfect set-up for families. Upstairs has a huge u-shaped sofa with LCD TV and DVD player. Downstairs has two large sofas with LCD and DVD player. Thanks for your wonderful review, I really appreciate it. I like the Bali Balcony name you came up with. Yes, I heard the Chinese restaurant at the club is going, it might be replaced with Italian, which would be good. I look forward to hearing from you for your 7th annual visit!! The whole family had a great time, the house is fantastic with superb views and we really enjoyed staying there. Amazing decor, large and spacious, great for family vacations. Owner very quick to respond for any questions. Best birthday ever! A piece of paradise, the house is beautifully furnished with everything you need unwind relax and enjoy! We loved this house for 2 families. 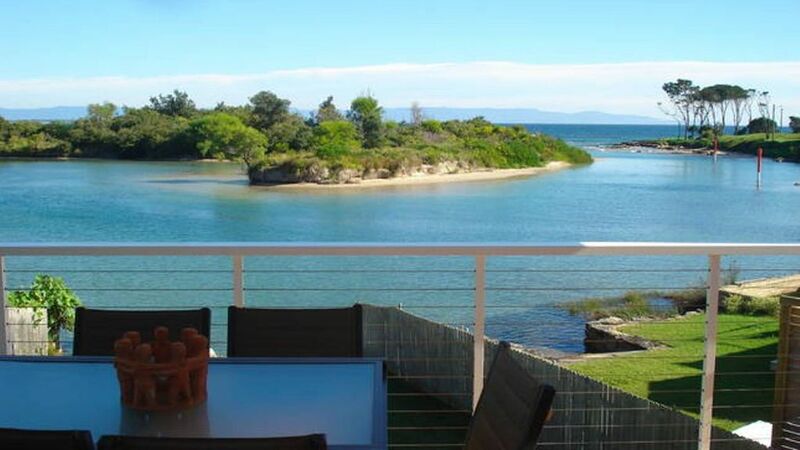 The location is amazing, sheltered yet ocean views, comfortable and well equipped. We will definitely be back. 5 stars! The beaches around Currarong are peaceful, uncrowded and beautiful. The main beach, which is 50m from the house, stretches for 13 kms around to Culburra. There are plenty of places along the beach to surf, snorkel, swim , fish and kayak. There are excellent walks around Beecroft Head with tracks accessed from Abraham's Bosom Reserve, also known as Bosom Beach. There's a boat ramp in the village if you have your own boat. Visit Point Perpendicular light house at Beecroft Peninsula for views over Jervis Bay and explore the many nearby beaches with squeaky white sand and pristine turquoise waters. Just 10 minutes drive from the house. There are golf clubs at Callala Beach and Nowra. There's a number of wineries nearby which are great for tastings and meals. Try Cupits in Milton, the Silos in Meroo Meadow or Cambewarra Estate wineries. Nowra is the hub of the area with shopping, cinema and ten-pin bowling.